The publishing community is so much bigger than it was before the self-publishing boom and it continues to grow exponentially every day. Unfortunately, it doesn't come with a handbook or support group. #AmWriting is a collection of letters written by authors from all different corners of the publishing community. The letters provide words of encouragement or advice to those just starting out or those who have become discouraged in their art. At Pure Textuality PR, we believe in supporting each other as a community, and we felt this project would be a good way to bring writers together and maybe give some new artists just the right nudge to keep going. 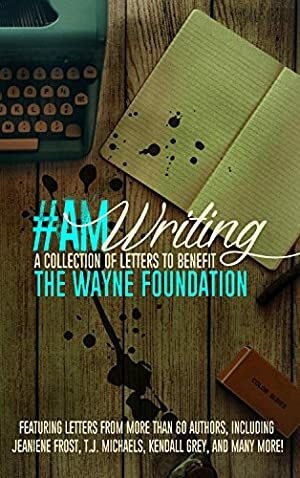 #AmWriting features letters from more than 70 authors, including Jeaniene Frost, T.J. Michaels, Kendall Grey, and many more! Log In to track A.D. Ellis on eReaderIQ. to be notified each time the price drops on any book by A.D. Ellis. to stop tracking A.D. Ellis. Log In to track Addison Kline on eReaderIQ. to be notified each time the price drops on any book by Addison Kline. to stop tracking Addison Kline. Log In to track Allyson Lindt on eReaderIQ. to be notified each time the price drops on any book by Allyson Lindt. to stop tracking Allyson Lindt. Log In to track Amber Lynn Natusch on eReaderIQ. to be notified each time the price drops on any book by Amber Lynn Natusch. to stop tracking Amber Lynn Natusch. Log In to track Amy Joy Lutchen on eReaderIQ. to be notified each time the price drops on any book by Amy Joy Lutchen. to stop tracking Amy Joy Lutchen. Log In to track Andrew Jericho on eReaderIQ. to be notified each time the price drops on any book by Andrew Jericho. to stop tracking Andrew Jericho. Log In to track Ashlynne Laynne on eReaderIQ. to be notified each time the price drops on any book by Ashlynne Laynne. to stop tracking Ashlynne Laynne. Log In to track Becky Flade on eReaderIQ. to be notified each time the price drops on any book by Becky Flade. to stop tracking Becky Flade. Log In to track Beth Dolgner on eReaderIQ. to be notified each time the price drops on any book by Beth Dolgner. to stop tracking Beth Dolgner. Log In to track Brandy Dorsch on eReaderIQ. to be notified each time the price drops on any book by Brandy Dorsch. to stop tracking Brandy Dorsch. Log In to track Brenda J. Pierson on eReaderIQ. to be notified each time the price drops on any book by Brenda J. Pierson. to stop tracking Brenda J. Pierson. Log In to track C.L. Foster on eReaderIQ. to be notified each time the price drops on any book by C.L. Foster. to stop tracking C.L. Foster. Log In to track C.L. Matthews on eReaderIQ. to be notified each time the price drops on any book by C.L. Matthews. to stop tracking C.L. Matthews. Log In to track Cassia Brightmore on eReaderIQ. to be notified each time the price drops on any book by Cassia Brightmore. to stop tracking Cassia Brightmore. Log In to track Cecilia London on eReaderIQ. to be notified each time the price drops on any book by Cecilia London. to stop tracking Cecilia London. Log In to track Cherron Riser on eReaderIQ. to be notified each time the price drops on any book by Cherron Riser. to stop tracking Cherron Riser. Log In to track Cithara Patra on eReaderIQ. to be notified each time the price drops on any book by Cithara Patra. to stop tracking Cithara Patra. Log In to track Courtney Houston on eReaderIQ. to be notified each time the price drops on any book by Courtney Houston. to stop tracking Courtney Houston. Log In to track Crystal Dawn on eReaderIQ. to be notified each time the price drops on any book by Crystal Dawn. to stop tracking Crystal Dawn. Log In to track Dulaney-Glen on eReaderIQ. to be notified each time the price drops on any book by Dulaney-Glen. Log In to track E.J. Stevens on eReaderIQ. to be notified each time the price drops on any book by E.J. Stevens. to stop tracking E.J. Stevens. Log In to track Elizabeth Sharp on eReaderIQ. to be notified each time the price drops on any book by Elizabeth Sharp. to stop tracking Elizabeth Sharp. Log In to track Ella Col on eReaderIQ. to be notified each time the price drops on any book by Ella Col.
to stop tracking Ella Col.
Log In to track Emersyn Vallis on eReaderIQ. to be notified each time the price drops on any book by Emersyn Vallis. to stop tracking Emersyn Vallis. Log In to track Emily Cyr on eReaderIQ. to be notified each time the price drops on any book by Emily Cyr. to stop tracking Emily Cyr. Log In to track Emma on eReaderIQ. to be notified each time the price drops on any book by Emma. Log In to track Emma Nichols on eReaderIQ. to be notified each time the price drops on any book by Emma Nichols. to stop tracking Emma Nichols. Log In to track Erin Hayes on eReaderIQ. to be notified each time the price drops on any book by Erin Hayes. to stop tracking Erin Hayes. Log In to track Erynn Crittenden on eReaderIQ. to be notified each time the price drops on any book by Erynn Crittenden. to stop tracking Erynn Crittenden. Log In to track Felicia Starr on eReaderIQ. to be notified each time the price drops on any book by Felicia Starr. to stop tracking Felicia Starr. Log In to track Gabbie S. Duran on eReaderIQ. to be notified each time the price drops on any book by Gabbie S. Duran. to stop tracking Gabbie S. Duran. Log In to track Geri Glenn on eReaderIQ. to be notified each time the price drops on any book by Geri Glenn. to stop tracking Geri Glenn. Log In to track Harlie Williams on eReaderIQ. to be notified each time the price drops on any book by Harlie Williams. to stop tracking Harlie Williams. Log In to track J. Nichole Parkins on eReaderIQ. to be notified each time the price drops on any book by J. Nichole Parkins. to stop tracking J. Nichole Parkins. Log In to track J.B. McGee on eReaderIQ. to be notified each time the price drops on any book by J.B. McGee. to stop tracking J.B. McGee. Log In to track J.M. Gregoire on eReaderIQ. to be notified each time the price drops on any book by J.M. Gregoire. to stop tracking J.M. Gregoire. Log In to track Jamie Summer on eReaderIQ. to be notified each time the price drops on any book by Jamie Summer. to stop tracking Jamie Summer. Log In to track Jeaniene Frost on eReaderIQ. to be notified each time the price drops on any book by Jeaniene Frost. to stop tracking Jeaniene Frost. Log In to track Jess Haines on eReaderIQ. to be notified each time the price drops on any book by Jess Haines. to stop tracking Jess Haines. Log In to track Jessica Cage on eReaderIQ. to be notified each time the price drops on any book by Jessica Cage. to stop tracking Jessica Cage. Log In to track Jody Pardo on eReaderIQ. to be notified each time the price drops on any book by Jody Pardo. to stop tracking Jody Pardo. Log In to track K.c. Stewart on eReaderIQ. to be notified each time the price drops on any book by K.c. Stewart. to stop tracking K.c. Stewart. Log In to track Karina Espinosa on eReaderIQ. to be notified each time the price drops on any book by Karina Espinosa. to stop tracking Karina Espinosa. Log In to track Kasey Belle on eReaderIQ. to be notified each time the price drops on any book by Kasey Belle. to stop tracking Kasey Belle. Log In to track Katie Kenyhercz on eReaderIQ. to be notified each time the price drops on any book by Katie Kenyhercz. to stop tracking Katie Kenyhercz. Log In to track Katie Lewington on eReaderIQ. to be notified each time the price drops on any book by Katie Lewington. to stop tracking Katie Lewington. Log In to track Kendall Grey on eReaderIQ. to be notified each time the price drops on any book by Kendall Grey. to stop tracking Kendall Grey. Log In to track Kory M. Shrum on eReaderIQ. to be notified each time the price drops on any book by Kory M. Shrum. to stop tracking Kory M. Shrum. Log In to track Kristina Borden on eReaderIQ. to be notified each time the price drops on any book by Kristina Borden. to stop tracking Kristina Borden. Log In to track L.A. Cotton on eReaderIQ. to be notified each time the price drops on any book by L.A. Cotton. to stop tracking L.A. Cotton. Log In to track L.E. Chamberlin on eReaderIQ. to be notified each time the price drops on any book by L.E. Chamberlin. to stop tracking L.E. Chamberlin. Log In to track L.U. Ann on eReaderIQ. to be notified each time the price drops on any book by L.U. Ann. to stop tracking L.U. Ann. Log In to track Leanna Renee Hieber on eReaderIQ. to be notified each time the price drops on any book by Leanna Renee Hieber. to stop tracking Leanna Renee Hieber. Log In to track Lexi Ostrow on eReaderIQ. to be notified each time the price drops on any book by Lexi Ostrow. to stop tracking Lexi Ostrow. Log In to track Leyla Kader Dahm on eReaderIQ. to be notified each time the price drops on any book by Leyla Kader Dahm. to stop tracking Leyla Kader Dahm. Log In to track Louisa Lo on eReaderIQ. to be notified each time the price drops on any book by Louisa Lo. to stop tracking Louisa Lo. Log In to track M. Never on eReaderIQ. to be notified each time the price drops on any book by M. Never. to stop tracking M. Never. Log In to track M.L. Steinbrunn on eReaderIQ. to be notified each time the price drops on any book by M.L. Steinbrunn. to stop tracking M.L. Steinbrunn. Log In to track Mary Crawford on eReaderIQ. to be notified each time the price drops on any book by Mary Crawford. to stop tracking Mary Crawford. Log In to track Michelle Mcloughney on eReaderIQ. to be notified each time the price drops on any book by Michelle Mcloughney. to stop tracking Michelle Mcloughney. Log In to track Mike Gonzales on eReaderIQ. to be notified each time the price drops on any book by Mike Gonzales. to stop tracking Mike Gonzales. Log In to track Misha Carver on eReaderIQ. to be notified each time the price drops on any book by Misha Carver. to stop tracking Misha Carver. Log In to track Misha Elliott on eReaderIQ. to be notified each time the price drops on any book by Misha Elliott. to stop tracking Misha Elliott. Log In to track Muriel Garcia on eReaderIQ. to be notified each time the price drops on any book by Muriel Garcia. to stop tracking Muriel Garcia. Log In to track Nicole L. Daffurn on eReaderIQ. to be notified each time the price drops on any book by Nicole L. Daffurn. to stop tracking Nicole L. Daffurn. Log In to track Nicole Zoltack on eReaderIQ. to be notified each time the price drops on any book by Nicole Zoltack. to stop tracking Nicole Zoltack. Log In to track Nikki Rae on eReaderIQ. to be notified each time the price drops on any book by Nikki Rae. to stop tracking Nikki Rae. Log In to track Pamela K. Kinney on eReaderIQ. to be notified each time the price drops on any book by Pamela K. Kinney. to stop tracking Pamela K. Kinney. Log In to track R.A Mizer on eReaderIQ. to be notified each time the price drops on any book by R.A Mizer. to stop tracking R.A Mizer. Log In to track Rachel Walter on eReaderIQ. to be notified each time the price drops on any book by Rachel Walter. to stop tracking Rachel Walter. Log In to track Rebecca Sherwin on eReaderIQ. to be notified each time the price drops on any book by Rebecca Sherwin. to stop tracking Rebecca Sherwin. Log In to track Renee Dyer on eReaderIQ. to be notified each time the price drops on any book by Renee Dyer. to stop tracking Renee Dyer. Log In to track Sara Dobie Bauer on eReaderIQ. to be notified each time the price drops on any book by Sara Dobie Bauer. to stop tracking Sara Dobie Bauer. Log In to track Scarlett Metal on eReaderIQ. to be notified each time the price drops on any book by Scarlett Metal. to stop tracking Scarlett Metal. Log In to track Serena Kearney on eReaderIQ. to be notified each time the price drops on any book by Serena Kearney. to stop tracking Serena Kearney. Log In to track Shakuita Johnson on eReaderIQ. to be notified each time the price drops on any book by Shakuita Johnson. to stop tracking Shakuita Johnson. Log In to track Shannon Bell on eReaderIQ. to be notified each time the price drops on any book by Shannon Bell. to stop tracking Shannon Bell. Log In to track Susan Schwartz on eReaderIQ. to be notified each time the price drops on any book by Susan Schwartz. to stop tracking Susan Schwartz. Log In to track T.J. Michaels on eReaderIQ. to be notified each time the price drops on any book by T.J. Michaels. to stop tracking T.J. Michaels. Log In to track T.L. Manning on eReaderIQ. to be notified each time the price drops on any book by T.L. Manning. to stop tracking T.L. Manning. Log In to track Taylor Lavati on eReaderIQ. to be notified each time the price drops on any book by Taylor Lavati. to stop tracking Taylor Lavati. Log In to track Tracie Podger on eReaderIQ. to be notified each time the price drops on any book by Tracie Podger. to stop tracking Tracie Podger. Log In to track Xandra James on eReaderIQ. to be notified each time the price drops on any book by Xandra James. to stop tracking Xandra James. Log In to track Jena Gregoire on eReaderIQ. to be notified each time the price drops on any book by Jena Gregoire. to stop tracking Jena Gregoire. We started tracking this book on August 10, 2016. This book was £1.39 when we started tracking it. The price of this book has changed 5 times in the past 988 days. The current price of this book is FREE last checked 5 hours ago. The lowest price to date was FREE last reached on April 20, 2019. The highest price to date was £2.29 last reached on July 19, 2017. This book has been £2.29 one time since we started tracking it. We last verified the price of this book about 5 hours ago. At that time, the price was £0.00. This price is subject to change. The price displayed on the Amazon.co.uk website at the time of purchase is the price you will pay for this book. Please confirm the price before making any purchases.